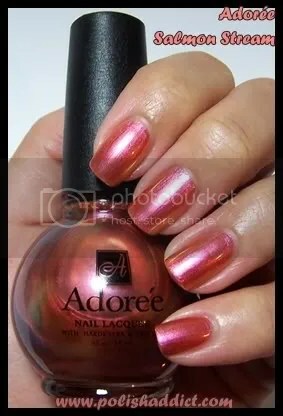 I’ve been eyeballing the Adorée duochromes, as I know some of you have, for some time now. 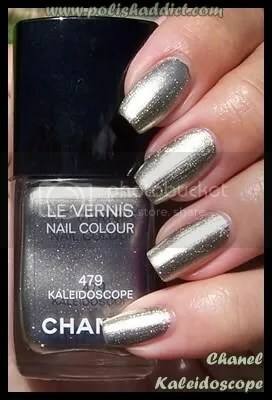 I was hoping for some opaque duochrome-y goodness but alas [throws arm over forehead] these are… sheer. There must be something about the chemical formula that creates the multichromatic effect that causes most high intensity duochromes to be sheer. It’s not that I dislike these colors, I was just expecting something different. Ultimately, I’ve accepted this cruel… cruel fate, I love duochromes and I just have to deal with the fact that, to my chagrin, duochromes tend to be sheer. 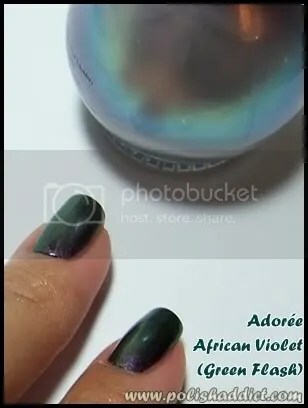 Adorée African Violet is super sheer, this swatch is 4 coats. I couldn’t get good pictures of the duochromatic effect but it is visible despite the sheerness. This color by itself with no colored base creates a greenish cast at some angles. 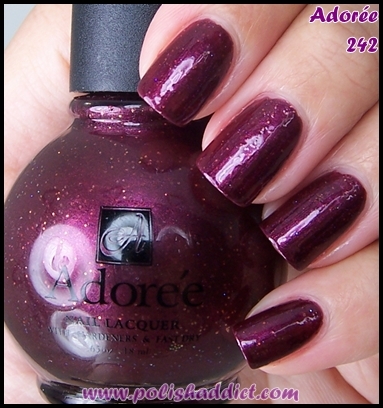 It’s very pretty and seems to be a distant cousin of the coveted OPI Sugarplum Yum. Ultimately, due to my preference for opacity, this African Violet is probably not something that I would wear on its own but it’s a great color for layering. Adorée Salmon Stream has gotten nothing but raves from the people who own it. 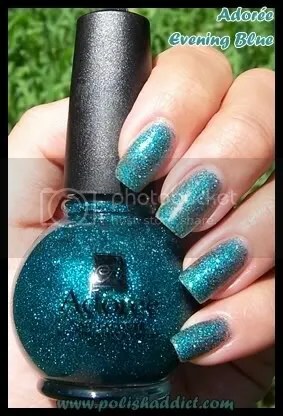 It’s not very me but I can see what polish lovers like about his color. 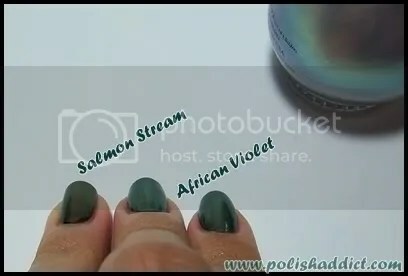 It’s less sheer than African Violet, this swatch is also 3 coats. I guess the best description of this color would be copper with a fuchsia tinge and a green cast at some angles. Now, *this* is more like it. 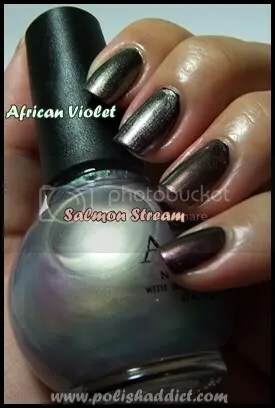 African Violet and Salmon Stream over black create amazing colors. 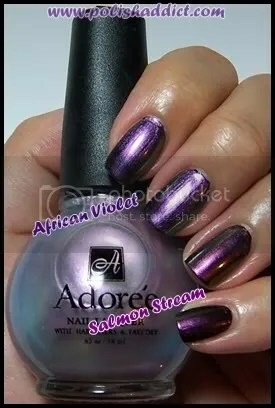 African Violet over black is dark purple and Salmon Stream becomes a fuchsia toned purple. This swatch above is representative of the grayish transitory color that the wearer would get at some angles before reaching the dark green extreme of the chromatic spectrum. The swatches below are representative of the green end of the chromatic spectrum. Don’t mind my silly finger contortions. It was the only way to get these greens to photograph. 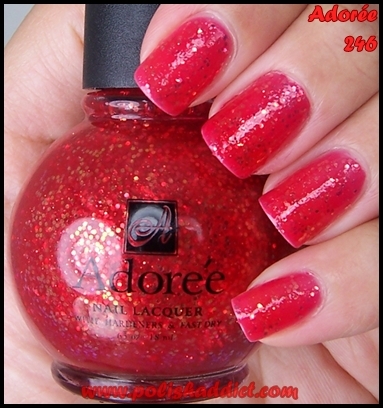 Adorée is available from Esther’s Nail Center in the U.S. and Nail Pro Store in Europe. 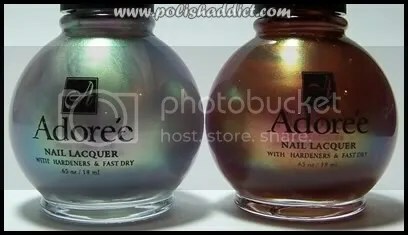 Most people that are into nail polish stick to the biggies: OPI, Essie, China Glaze, Color Club, Orly, Zoya, and the Drug Store brands. I know I’m particularly guilty of not venturing away from those very often. So I’m always excited to try out new brands. 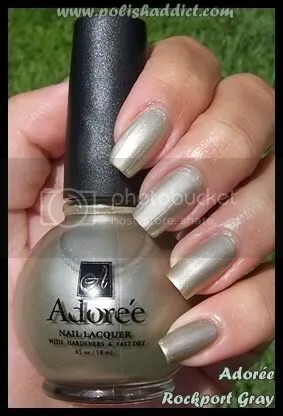 I’m pretty impressed with Adorée. First and most importantly, they aren’t expensive at 5 bucks a pop. 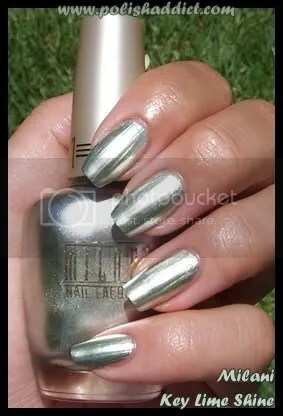 The line is big 3 free but the polishes applied as if they had all the chemically goodness of which we are all so fond. 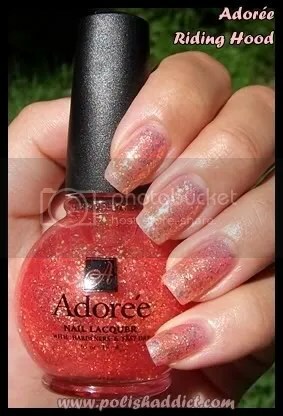 I had good wear time with Seche Vite as a top coat and my typical work horse base coat. I’m also really impressed with the range and variation of color in their line. 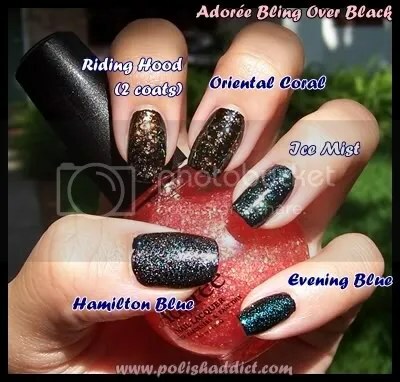 They actually have really unique polishes. We’re talking duo/multi-chromes, mutli-glitters here, people. 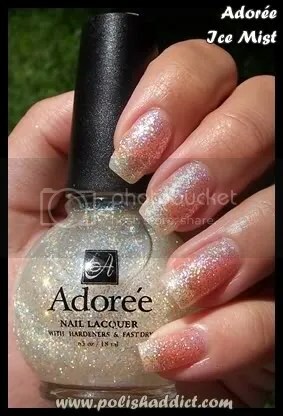 I only have three polishes to show you guys but definitely check them out at Esther’s Nail Center (they’re also having a sale on Nubar). 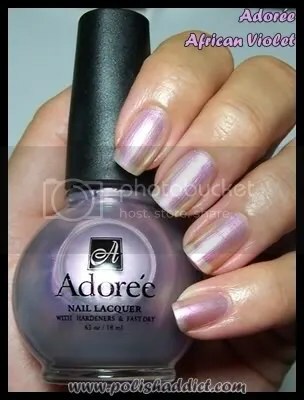 Adorée Wild Inkberry is my favorite. It reminds me of a purple version of Essie Starry Starry Night. 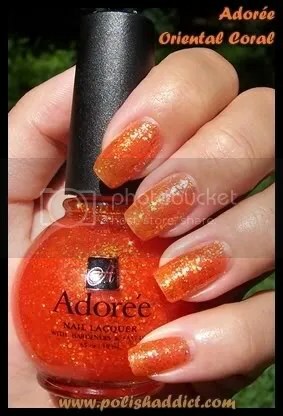 It’s a glitter polish but doesn’t dry with a rough finish, a plus. You can control the amount of bling by adding coats. This swatch is 4 coats. Normally that would drive me UP the wall but the polish looked good with 2 coats, 4 coats just made it a deeper purple and extra bling. Love it. Adoree Peony is impossible to photograph. The color has strange texture, as though it were pearlescent but it’s not. 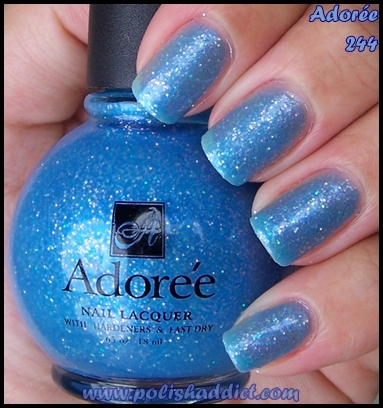 It also has loose holographic glitter in it so it dries bumpy a la China Glaze Flying Dragon and Blue Sparrow. The bumpiness is easily fixed with a thick coat of Seche Vite. This color isn’t really me but I know a lot of you peeeenk lovers are going to go bonkers for this. It’s a great pedi color. 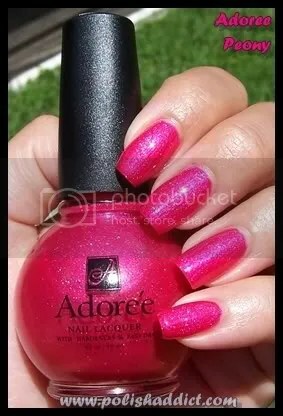 And finally a subtle one, Adoree Pink Pansy, a buildable sheer pink with a blue flash. 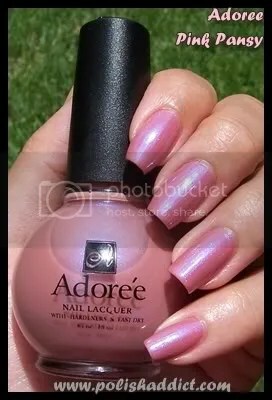 I needed 4 coats to cover the whites of my nails, but like with Wild Inkberry, Pink Pansy applied very well and looked great at two coats. As a personal preference, I don’t like sheers, so buildable sheers are great for me. 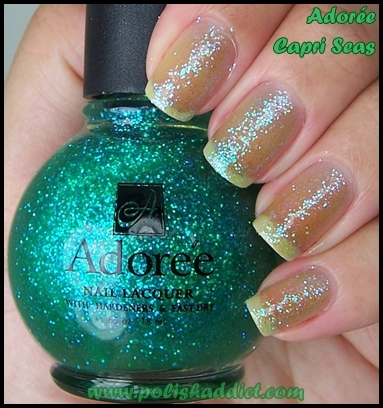 Since this color has a blue flash, at two coats, it’s perfect for a Funky French. I know I have a white with blue flash somewhere so I’m going to try it out.